Piedmont Office Realty Trust Announces Strategic Capital Markets Transactions -- Sells Aon Center in Chicago and Acquires SunTrust Center in Orlando and Galleria 300 in Atlanta | Piedmont Office Realty Trust, Inc.
On the disposition front, Piedmont completed the sale of The Aon Center, a 2.7 million square foot, 83-story office tower, located at 200 E. Randolph Street in downtown Chicago. The 601W Companies, a private real estate investment company, purchased the multi-tenant Class A building for a gross sales price of $712 million ($260 per square foot). The building was constructed in 1972 and is situated on approximately 3.5 acres in Chicago's East Loop and is approximately 87% leased. Piedmont's Ray Owens, Executive Vice President - Capital Markets, Tom Prescott, Executive Vice President - Midwest Region, and Keith Willby, Director - Capital Markets, along with the JLL team of Bruce Miller and Nooshin Felsenthal, facilitated negotiations on behalf of the seller. The Company previously announced that it would use the proceeds from the Aon Center sale as well as the disposition of three non-strategic assets during the third quarter of 2015 to pay down corporate debt, to opportunistically repurchase shares of its own common stock, and to acquire strategic assets with earnings growth potential. Orlando, FL and Galleria 300 in Atlanta, GA for approximately $259.1 million. Piedmont's Wil Stone, Senior Vice President - Capital Markets and Brad Pittman, Vice President - Capital Markets, handled negotiations on behalf of the Company. 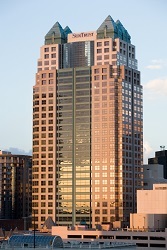 SunTrust Center, a 654,618 square foot project, located at 200-250 South Orange Avenue in downtown Orlando, FL, is comprised of a 30-story, 570,874 square foot Class A trophy office tower, and a 7-story, 83,744 square foot building with an adjoining 1,292 space parking garage. It was constructed in 1988 and is 89% leased to multiple tenants. 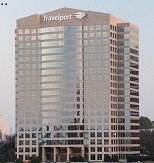 Galleria 300, located at 300 Galleria Parkway in Atlanta, GA, is a 20-story, 432,934 square foot Class A office tower with an adjoining 1,152 space parking garage. It was constructed in 1987, and is also an 89% leased, multi-tenant property. "We are pleased to announce the closing of these two capital markets transactions, as well as our success in executing a strategic and timely recycling of capital from one large property into two well-located properties in improving markets, such as Atlanta and Orlando," said Piedmont President and Chief Executive Officer Donald A. Miller, CFA. "Details on the use of the remaining proceeds from the Aon Center sale and other recent dispositions will be disclosed in the coming week, and will include updates on repurchases of common stock and repayment of outstanding debt," concluded Miller. Piedmont Office Realty Trust, Inc. (NYSE: PDM) is an owner, manager, developer, and operator of high-quality, Class A office properties located in select sub-markets of major U.S. cities. Its geographically-diversified, over $5 billion portfolio is comprised of more than 19 million square feet. The Company is a fully-integrated, self-managed real estate investment trust (REIT) with local management offices in each of its major markets and is investment-grade rated by Standard & Poor's (BBB) and Moody's (Baa2). For more information, see www.piedmontreit.com.